Evangelist Billy Graham has tacitly endorsed Mitt Romney’s presidential bid and his website no longer characterizes the Church of Jesus Christ of Latter Day Saints (the Mormons) as a cult. This is just another sign that a major realignment is underway in American religion. Evangelicals defined themselves in opposition to Roman Catholicism until the late 1970s when activist-preachers like Francis Schaeffer and Jerry Falwell built a new evangelical coalition around an unreconstructed version of Catholic pro-life theology. This informal evangelical-Catholic coalition was driven by a fear of liberalism in both its secular and religious expressions. Throughout the 1970s few evangelicals gave much thought to the abortion issue. In fact, the Southern Baptist Convention essentially endorsed Roe v. Wade at its annual conventions as late as 1976. A decade later, a thoroughgoing pro-life position had become a litmus test among American evangelicals. I have always thought highly of Billy Graham. One of my earliest memories is watching my father polishing the family’s shoes in the basement of our home in Yellowknife in the Canadian Northwest Territories circa 1957. Dad would get line up the pumps and oxfords, fetch the polish, and tune the radio to Billy Graham (CFYK was the only station in Yellowknife, so this wasn’t too challenging). Around that time, a film celebrating Graham’s triumphant 1954 crusade in London, England was shown at Calvary Baptist Church. I was too young to give much thought to Graham’s sermons but, judging from the response of the adults in my world, Billy was a kind of unconsecrated evangelical pope. It was in this capacity that Billy Graham offered his encouragement and counsel to each succeeding president. As Darren Dochuk makes clear in his book, “From Bible Belt to Sunbelt: Plain-Folk Religion,Grassroots Politics,and the Rise of Evangelical Conservatism”, Billy Graham was a product of the evangelical hothouse taking root in the Southern California soil after the Second World War. His politics were conservative with a strong dose of anti-communism and a casual assumption that capitalism and Christianity were inextricably linked. Still, Graham reached out to presidents of both parties whether or not he liked their politics. Graham’s errand to the White House turned sour in 1972 when he got too close to the soon-to-be-disgraced Richard Nixon. When a tape of Graham and Nixon sharing concern about the Jewish control of the American media surfaced, Graham’s reputation took a beating. “This stranglehold has got to be broken or the country’s going down the drain,” Graham said, agreeing with a lamentable stream of bigoted Nixon comments about Jews and their perceived influence in American life. “You believe that?” Nixon says after the “stranglehold” comment. “No, but if you get elected a second time, then we might be able to do something,” Graham replies. Years later when this tape was released to the public, Graham had a hard time believing his ears. The voice was undoubtedly his, but he had no recollection of the conversation and disavowed the sentiments expressed in it. How had he been seduced into saying such terrible things? Nonetheless, Billy Graham was never a champion of civil rights and southern whites who had gone to the wall to preserve the Jim Crow South were his natural constituency. The evangelical movement, like the Republican Party of the Reagan era, was shaped by southern white resentment. Jews were suspect because they had backed the civil rights movement, had cooled to the Vietnam war, and insisted on the strict separation of church and state. Although few were crude enough to say so in public, Liberals, African Americans and Jews formed a kind of unholy trinity to which white evangelicalism was ideologically opposed. For some, this was a matter of crude bigotry, but for most the antipathy wasn’t personal. These folks just happened to be on the wrong side of a struggle for the heart and soul of America. Alternatively, Mormons like Mitt Romney are gradually being embraced by American evangelicalism because they are on the right side of the liberal-conservative fight. The rapprochement is far from total. At the Baptist Leadership Training School I attended in 1972, we were taught that the Mormon Church was a cult. Simple as that. Now it’s not so simple. Evangelicals disagree with Catholics and Mormons on a wide range of theological issues, but in the twenty-first century, ideology trumps theology. Conservative Catholics pass muster so long as their concern for the poor takes a back seat to their pro-life principles. If you can get past theology, white evangelicals and Mormons are cut from the same bolt of cloth. Both groups are highly patriotic, endorse hard work and personal responsibility, believe in a small government and insist on a dominant military. Truth be told, both groups have backed away from their traditional embrace of white supremacy gradually and with a marked lack of consistency or sincerity. This racial ambivalence is easily explained. Jim Crow enthusiasts took a terrible psychological thumping during the civil rights movement of the 1960s. Men and women who had traditionally seen themselves as the conscience and moral heartbeat of America, suddenly found themselves denounced as bigots and haters, a loathsome cancer that should be excised from the body politic. Southern evangelicals never recovered from the shock. For a decade, they licked their wounds, content to withdraw into the world of Bible-believing churches and segregated “Christian” schools. The primary goal was to be left alone. According to arch-conservative Paul Weyrich, the Christian Right was founded in reaction to the perception that the once-beloved Jimmy Carter intended to subject private schools to taxation. Over three decades later, the specter of “liberalism” has grown to monstrous proportions in the evangelical imagination. If you hate liberals, the religious Right is willing to be your friend. 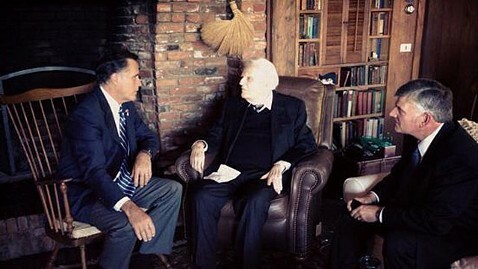 This explains why Billy Graham and other evangelicals are making peace with Mitt Romney’s Mormonism. Their theological opposition to the Latter Day Saints hasn’t dimmed in the least, but anti-liberal ideology, not Christian theology, calls the tune in this brave new world of ours. The Religious Right inhabits a Manichean world. They can only be bathed in light if their opponents are shrouded in darkness. If evangelicals represent the salvation of the world, liberals must spell the damnation of all things good and lovely. They simply must. Aye, there’s the rub: liberals deny that America is a Christian nation or that Christianity should enjoy a privileged status above all other religions. Religious pluralism sounded okay in the days of Dwight D. Eisenhower when a watered-down form of Christianity was the nation’s undisputed civil religion. If, as famed church historian Kenneth Scott Latourette famously suggested, the 19th century was the Evangelical Century, the 20th Century was a time of twilight struggle between evangelicalism and liberalism. Will the 21st Century see the restoration of the evangelical hegemony Franklin Graham longs to see, or a rapid slide into the sloppy religious pluralism you read about in Religious Dispatches? For the Religious Right, that’s what this election is all about. Is there no alternative to the resotation of the evangelical hegemony Franklin Graham longs to see and sloppy religious pluralsm? Is religious pluralism by definition sloppy? I think not.